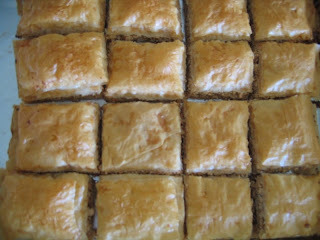 Baklava - This awesome middle eastern pastry sweet was completely new to me when I tasted it for the first time a month ago. I was craving for some Indian sweets but ended up getting this, did not have much hopes on first look, but when I took a bite, it was yummmmmmm. Recently got the recipe for this and tried at home, it was great. You need Fillo pastry sheets to do this. Hunting for the Fillo / Phyllo dough was not difficult too. If you are not already aware, the Fillo sheets are very very very thin, that it needs a very gentle and careful treatment. I guess the Athens Fillo brand is the quite common one and I could easily spot it in the International shop, they say it is also available in Walmart and some other super markets in the frozen section. As such the recipe is no big deal, Arrange the fillo sheets, butter them, stuff them with nuts, bake them. Make a simple syrup, pour it on top of Baklava and let it set. Process is simple but handling the Fillo sheets is the challenging part which might be difficult the first time, but result will be definitely worth it. And am sure when u repeat it, it becomes an easy job. I think this is one super-duper sweet for Give-Away's or Pot Luck. 2) For stuffing, you can use any single or combination of nuts, I used cashews and walnuts. Take 1/2 cup of each, grind to coarse texture, add couple of spoons of sugar to taste, pinch of cinnamon. Mix well. Now stuffing is ready. 4) Carefully pull one sheet , place it on the greased pan, brush it thoroughly with butter using pastry brush, pull another sheet from the set and place it on top of first buttered sheet, brush it with butter, then one more on top and like this arrange about 8-10 sheets. After 8-10 sheets are layered after buttering, spread half of the prepared nut mixture evenly on the sheet. Repeat placing the sheets on top of the nuts and butter each one for about 3-4 sheets. Again spsread the remaining nut mixture as even layer and cover it with 8-10 more sheets of buttered fillo as the top covering. This process might take time, to carefully set them and butter them. It is NOT an issue if some sheets are getting torn, as with so many layers in the sweet, the wear and tear will be barely visible in the end result. 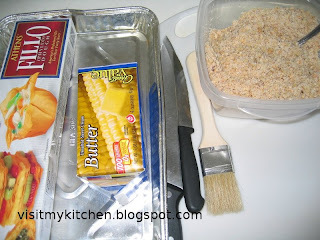 6) After arranging the layers, use a sharp serrated knife to cut them (till the bottom, taking care not to cut the pan) to squares of required sizes. This has to be done before baking, as after baking if u try to cut, it will splutter to pieces. 7) Bake this for about 20-30 mins or till top is golden brown. The time really changes with the number of layers and all, so best is to keep a watch for it to get a light brown color. In some of the pics, mine looks more golden due to lighting, ideally it will be a creamier brown. 8) For the Syrup: In 2 cups of water, add 2 cups of sugar, 2 tbsp of honey, a juice of half lime and bring it to nice boil. Lower the flame and boil till the syrup thickens little bit. Set this aside. 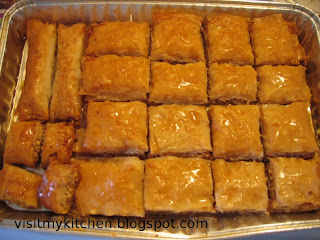 9) Once baking is done, let the baklava rest for about 30 mins, once its cool, pour the syrup all over the baklava such that it reaches every corners and sides. Let this set overnight (for best taste) and the next day can be refrigerated. This can be kept oustide for couple of days or refrigerated for a month or more. 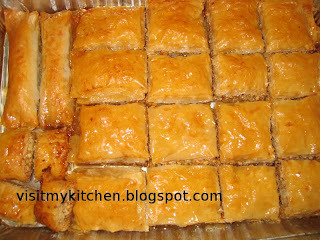 Make sure Baklava is cooled down when u add the medium hot syrup, else it becomes very soggy. I love this recipe as its so versatile. The whole recipe can be modified to suit your taste, you can alter the number of layers, you can alter the nut mixture per your choice and also the syrup to suit ur taste by adding more sugar or less or no honey or more honey and lime etc. So play with it.. Alternative to the square ones, you can also take thin rectangles , 3-4 sheets, butter them, place 1 big spoon of nuts, towards the wider edge of rectangle and roll this tight like cigars. This will be like cigars/spring rolls. This could be further cut into bite sized pieces too. This will be much more easier to make. But make sure different shapes are sitting in differnt pans as with the number of layers, the baking time differs. Pastry brush is really really required to butter the thin fillo sheets. Its not quite expensive, a dollar fifty or max $2 in walmart. Get the one with soft bristles. Thaw the Fillo as per instructions given in the box. Thawing in Refrigerator is better option. Usually an overnight thawing is required. Remove the thawed fillo sheets from the box, carefully unroll them, they will be a set of 20-30 thin rectangular sheets . Place your baking pan on top of the sheet and cut the required size of the fillo sheet. Place the rest of the Fillo immediately inside the pack and freeze it back. Always cover the fillo sheets with a plastic sheet and a damp towel. Once fillo gets dried up, it sticks. Wow this looks great!! good job!! One of my favorite dessert. Oh wow that looks perfect! You have made it like a pro! wow this looks so good! u have patience! 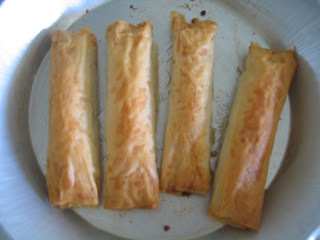 Sorry, I am not sure if you can use that for making Baklava..I havent used springroll, so no idea on that. GAAAWD - Must say u have lot of patience madam! Never in my life I can make this dish :P - Looks Awesome!